Discussion in 'Weapons' started by Martin Bull, Sep 20, 2018. OK, a cheeky heading - they've probably never been near Normandy. But I recently added something to my collection which has taken me years to find - an inert 17-pr A/T shell, similar to the type used by the Sherman Firefly. The projectile has been fired and recovered ( strangely, with no damage ) and the brass casing is dated 1944. 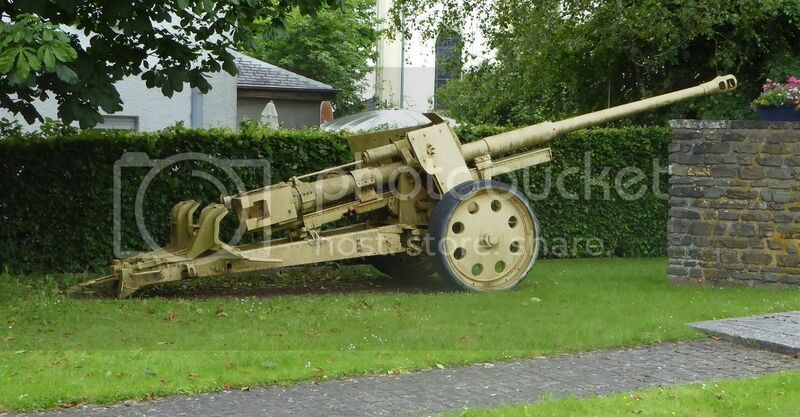 It sits on the right of my complete PaK/KwK 36 'Tiger 1' 88mm A/T round and makes an interesting comparison. One of my great interests is the armoured fighting in Normandy and I'm very pleased to have these two shells in my collection. gtblackwell, JJWilson, The_Historian and 3 others like this. Got a chance to handle some modern AP penetrators a few years ago. As you say not light. The long rod was particularly deceptive that way. I got a 40mm Bofors shell from a Derwent Class patrol boat stationed here in Darwin when I was about 12...by the time I was 16 I had turned it into the best looking bong you've ever seen! Great comparison photo, Martin. The case of the 88 illustrates a greater powder capacity and boy is that 17 pounder projectile huge!!. Now you can search for a Konigs Tiger round! At the risk of making myself very unpopular - I've got one ! George Patton, gtblackwell and CAC like this. Well, more popular in my book! That is a fantastic comparison as the 37MM was a common AT round at the beginning. That 88 is HUGE !! I know there were not many, some 400 + , but the idea of your Cromwell or Sherman being hit by one would be bone chilling. Well if any bones would be left ! It would give a new definition to the term "Brew up" I would have dropped my cup of Fortnum & Mason tea and run !!! Thank you for the illuminating post! Thanks, Gaines - I'm glad you liked the pic. Oh Sir Martin you dirty dawg you. That is a hefty piece. Aren't they rather tricky to track down in decent nick? We once chatted to a bloke from Cobbaton Combat with a 17pdr on display at a show along with a decent selection of available ammunition, including APCBC & Sabot. He reckoned the collection of cased rounds was probably worth more than the actual gun. Yes, ironically, 17prs are far harder to find than 88s. I've been looking for ages without success but recently a few wartime-dated rounds have appeared at the bigger fairs such as Beltring. Mine, being a fired round and AP, was 'cheap' at £150. Decent APCBC rounds tend to go for around £350 - if you can find one. There was one Sabot round on a stall at Beltring - asking price, £650. Anyhow, it's proudly dated '1944' so is fine for my collection. 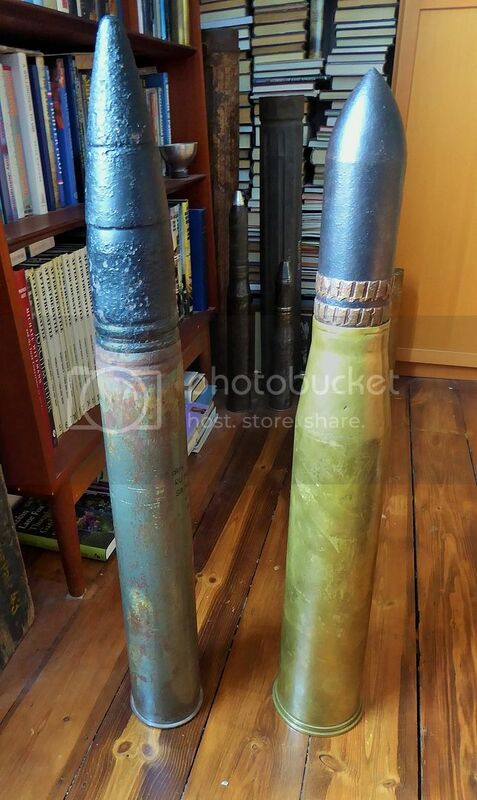 For my purposes, the two represent the type of shell Wittmann fired at Villers-Bocage, and the type which ended his life a few weeks later at St. Aignan. at 20 miles, this could ruin your whole day. the lady is 5'4". taken at USS South Dakota memorial. Yes indeed, naval shells are in a totally different league. And of course, they played a vital role in the Normandy fighting - killing, among many others, SS-Brigadefuhrer Fritz Witt, CO of the Hitlerjugend Division, on 14th June 1944.
gtblackwell, Martin Bull, George Patton and 1 other person like this. How about some diversification into "Ardennes Tank Killers"? Maybe a little 76mm HVAP-T? gtblackwell and Martin Bull like this. Know anyone who's got one? I want it to be live. i wonder why the projectile i showed was never fired during Normandy battles. the navy just sent a couple of old battleships and they left, along with any other USN bombardment force, after a month or so.